Here is a new tool for creating those often frustrating .htaccess files. 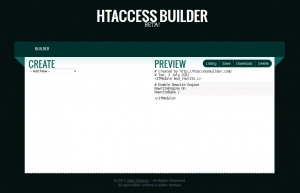 It has the catchy name of Htaccess Builder and has been created by yours truly. It is still in beta (like all great web 2.0 things) and I am looking for input to improve and expand it. It has a Uservoice page at https://htaccess.uservoice.com for any and all input, so please let me know what you think and what’s missing that you would like to see.